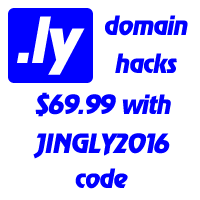 One of the best and jingling .ly sites, a music search engine song.ly, semi-tuned for Twitter, was just sold for $50,000 via Flippa. The site had also developed an API and a Firefox add-on. Despite low ranking at Alexa, considering all the perks, it is questionable whether the actual transfer will happen after this auction.